Posted on November 17, 2010 by Akashic Love & Light! Italy is the most romantic place in the world! As you enter the Amalfi Coast locks like these can be found along the rail overlooking the Tyrrhenian Sea. Further down the road rising high up into the cliffs are the small but dramatic looking villages of Positano, Ravello, Praiano, and Amalfi. By far my favorite spot in the world is the coastal village of Amalfi. I love the view from the Cathedral di Sant’Andrea; the church that overlooks the main square filled with cafes, shops, and people. Many Limoncello shops line the cobblestone streets where you can stop in for a shot or a bottle of this locally-made fresh lemon liquor. In the evening its fun to walk on the path along the water and have a gelato! This entry was posted in Italy and tagged Amalfi, Amalfi Coast, amalfi coast italy europe, Andrea, italy, Middle Ages, Positano, Praiano, Ravello. Bookmark the permalink. 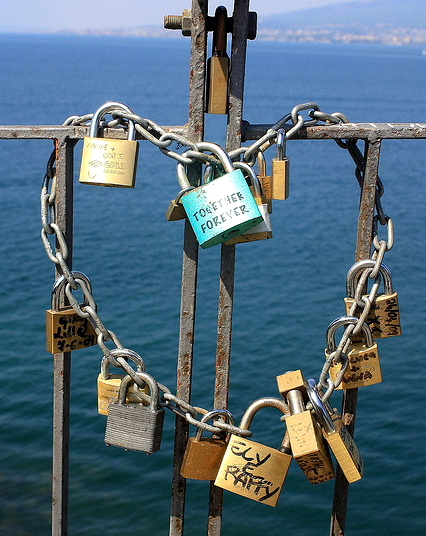 Hi – I am going to give my daughter a love lock for their honeymoon in Amalfi. Any insights, thoughts, places to leave it would be appreciated. That is so nice! What a good idea. On the way to the Amalfi coast, the only place I saw the locks were on an overlook that was located when passing through (or over)sorrento. That is where the photos are taken from, other than that I do not remember seeing the locks in other areas. 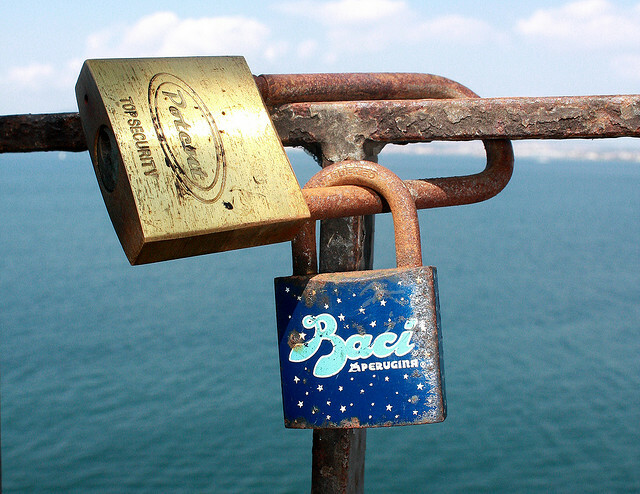 But they can always look for a bridge to lock the padlock onto and as a last resort go to the overlook by sorrento. Keep in mind they are not really allowed to to lock them to the bridges, so they should do it discretely, so they don’t get a fine or something. I have some photos of different locks printed if you want to get one as a present for them- feel free to email me at czenino@sbcglobal.net. I can email you some choices. I hope they have fun!